Your boiler going out was probably the last thing you wanted to have happen. But look on the bright side – Chelsea Cooling and Heating technicians are here for you every day. A boiler is a heating unit that can be configured to burn natural gas, propane, oil or electric to fuel the system that heats your home. 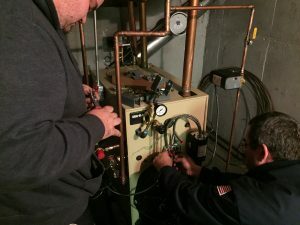 Boiler repairs are a little different from furnace repairs because their problems aren’t typically mechanical. A boiler that is more than 10 years old may be operating inefficient even when functioning properly because, it was designed inefficiently. When installed properly by a certified Chelsea Cooling and Heating Services technician, a new boiler system can operate at up to 90% efficiency or more. This means a more effective heating system that will not only save energy but also money.